Provide comfort for the family of Persephanie "Percy" Garcia with a meaningful gesture of sympathy. 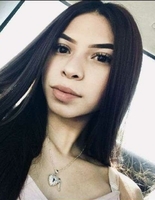 Persephanie “Percy” Garcia, 17, returned to her heavenly home on March 15, 2019. Percy was loved by so many friends and family! She had so much love for everyone she met. There wasn’t a dark place her beautiful smile couldn’t light up. She is survived by her mother, Kathryn Reyes and father, Adrian Garcia; her sister, Porsha, Monique Garcia and brother, Giovanni Soto; aunt, Stephanie, Uncle, Jacob Cox, Aunt Amanda, uncle Thurston Robinson, aunt Brenda Reyes; grandparents Sam and Linda Lara and soon to be nephew Zaylen. She will be greatly missed by so many friends and family. In our hearts she will stay forever! We are saddened by this tragedy but know she feels no more pain. God gained a beautiful Angel but we lost a big piece of our heart. Rest in peace beautiful angel! Visitation will be held on Tuesday, March 26, 2019 at the funeral home. Graveside services will be held at 10:00 am on, Wednesday, March 27, 2019 at Lawnhaven Memorial Gardens. Services are under the direction of Shaffer Funeral Home/Sherwood Way. To send flowers in memory of Persephanie "Percy" Garcia, please visit our Heartfelt Sympathies Store. We encourage you to share your most beloved memories of Persephanie "Percy" Garcia here, so that the family and other loved ones can always see it. You can upload cherished photographs, or share your favorite stories, and can even comment on those shared by others.